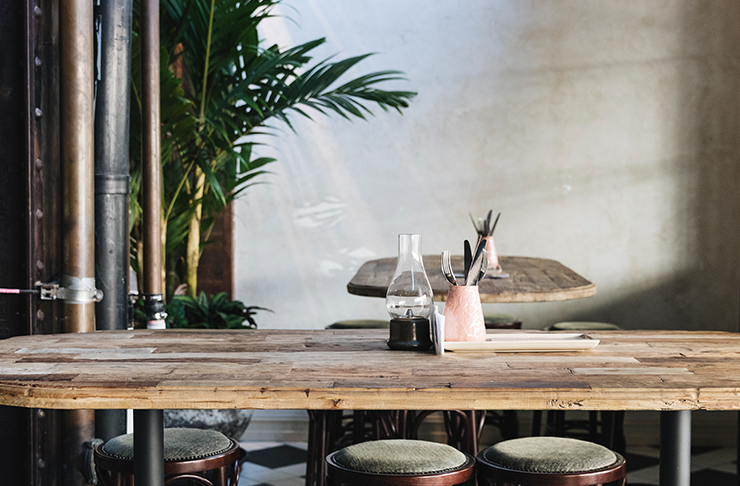 Finding somewhere to eat after 9pm is a struggle we can all appreciate, but if it’s a late feed you’re after Fortitude Valley is by far your best bet. Besides the clubs and cocktail bars, a precious few keep their kitchens open and their passes running so we don’t have to settle for the shredded cheese in our freezers. These are the best restaurants in Fortitude Valley serving food late. In stark contrast to the light, bright space of sister venue Happy Boy, Snack Man is moody, refined, the walls and décor a dark charcoal save for the impressive marble bar top. Food-wise the kitchen is offering a choice selection of expertly crafted dumplings, steam buns and bar snacks such as their chicken ribs—all of which go down far too easily with a bottle of wine from their list of boutique drops. We’ve been harping on about Beirne Lane for a while, and that’s in part because they’re open 24 hours a day. Their bar menu is available at all hours and includes their selection of katsu sandwiches, which are the perfect thing to have as a midnight snack. What a public service, what a house of the people. Billed as a social hub, X Cargo is its own microcosm where you can spend an entire evening, start to finish, and never feel the need to roam. Their American menu has a strong Latin influence and is best described as late night pickings with burgers, chicken ribs, chips, and charcuterie. Open until late Thursday through Sunday. Open until 2am on Friday and Saturday nights, Little Valley is the latest neo-Chinese connection serving up refined, contemporary dishes in the Valley. Their menu is a comprehensive gambol across all the regions of China, with dim sum, roast duck, and 24-hour beef short rib popping off the menu. Until 10pm Tuesday through Thursday, and until 11pm on Friday and Saturday nights, Ben’s serves up some of Brisbane’s most beloved burgers. Their pared-back approach to burg-building means you can count on a classic arrangement of sauce, meat and cheese when the hours get small. Besides a selection of seven craft beers, the Valley’s first and only brewery to date, Soapbox Beer, also boasts a resident gastropub. Perfect for late night feeds, their kitchen is open until late serving everything from fries and chicken wings to calamari and pork belly to go with lashings of craft. The tangle of bars, kitchens, and pool tables in the Heya labyrinth make it all too easy get lost in their subterranean rabble. Fortunate then that they stay open until 3am, with the kitchens trading until late so you can get your fix of dumplings, ramen and cheeseburger spring rolls. The best chicken yakitori in the city, Bird’s Nest offers contemporary Japanese until late every night of the week. This means charcoal chicken skewers and karaage until well after 9. Known for their owlish ways, Greaser Bar is up and trading until very late Wednesday through Saturday. 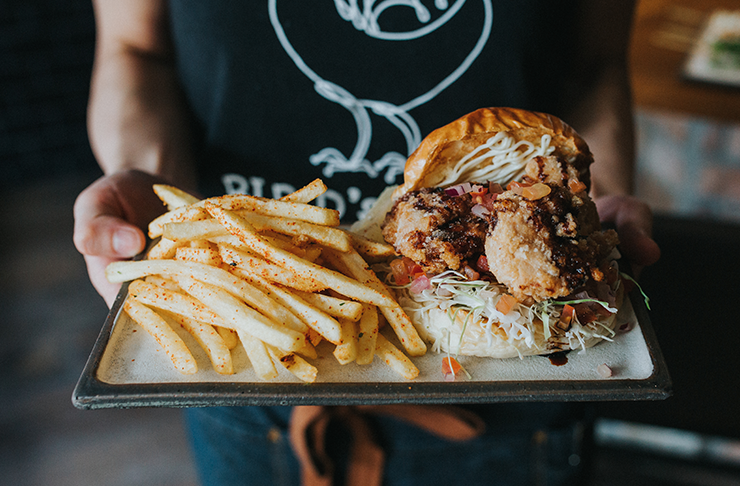 Their American-style menu features diner classics like burgers, fries, fried chicken, mozzarella sticks, and all the stuff you need to soak up a few hours of revelry. The first and only plant-based ramen in the country, i like ramen’s Fortitude Valley location will feed you until 9pm every night. While ramen is naturally their specialty, i like ramen also does a panko mushroom po’ boy as well as a collection of tasty small plates. Swing by any time before 10.30pm on Friday and Saturday nights and Harajuku Gyoza is up and serving dumplings and sake. Their model is ideal for catering to varying appetites as you can have just a few plates for a light snack, or build them up into a fully-fledged meal. For the best of burgers, hot dogs, and loaded fries, you can’t look past The American Diner Co., especially since they’re one of the last decent places to eat after 11pm. They trade until midnight on Thursdays, and until 4am on Friday and Saturday nights, so you can hang out there and get a feed while you’re waiting for the Uber surge to ease up. For something a little sweet to cap off your night, The Stand Dessert Bar has your sweet tooth well and truly catered for. Open until late on weekends, the Stand offers a whole bunch of puddings, pannacottas and loaded shakes, as well as some quality cocktails if you fancy kicking on. Need somewhere to bend the elbow? These are Brisbane's best breweries.